Rapido has re-announced with additional and changed information about their Flexi Flow Hoppers. Part numbers and paint schmes have been changed. So please review the new updated infromation below. All customer orders have been re-booked to reflect the updated information. Rapido in most cases is doing 6 road numbers in a set (not 4 road numbers as earlier advertised). So since they will be selling cars to Dealers in 6 car sets, if you want insure you get all cars make sure you order all cars from each set. 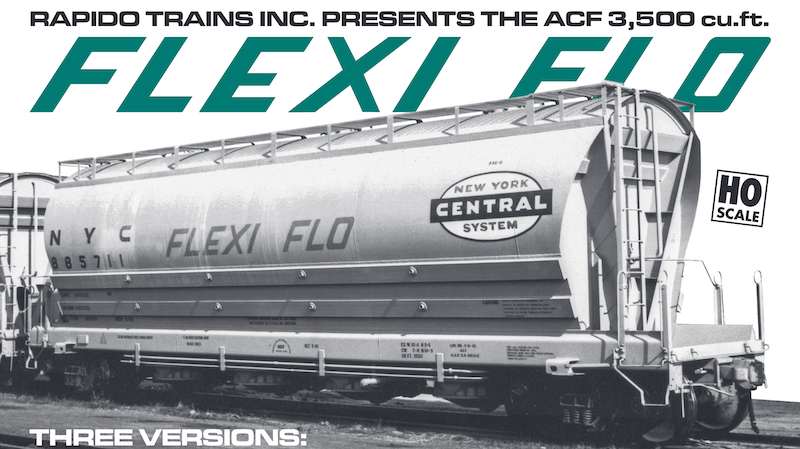 Rapido Trains Inc. is very pleased to announce the iconic ACF PD3500 Flexi Flo hopper in HO scale, already one of our most eagerly anticipated models ever. Built between August 1964 and June 1966 the American Car & Foundry (ACF) 3500 cu.ft. covered hopper was an early innovator in pressure differential unloading and a marketing masterclass thanks to the "Flexi Flo" tag coined by the car's biggest customer, the New York Central railroad. Other than seven cars built for Shippers Car Line (SHPX), a subsidiary of ACF, the NYC was the only purchaser of the PD3500. They made up for it in quantities, with a total of 220 cars rolling off the Milton, Pennsylvania, production line over three subtly different batches. Still new at the time of the Penn Central merger, many cars were simply repatched with PC prefix and logo and renumbered. However, plenty made it through those turbulent years with their full NYC paint unspoilt. Come the era of Conrail and many cars were repatched again, making them a rolling north-eastern railroad history lesson as patches faded showing PC and NYC logos beneath the famous "canopener"! Many others were repainted, with Conrail applying at least three different schemes. If there is any lingering feeling among railfans that these cars were captive to the north east then the 1980-90s should dispel that misconception as the cars spread their wings, first through the transfer of many cars to Conrail's Merchants Despatch Transportation Co. (MDTX) subsidiary, and then the later sale of cars to NAHX (for Lafarge) and SXSX/SYSX for use in Arizona, California and the south west, all gaining new paint schemes in the process. By 2000, an explosion of patchouts had taken place with a plethora of different reporting marks popping up and no part of the USA off limits. They were even more common in many parts of Canada! Many were still in use well into the mid 2010s, only being retired as they fell foul of the 50 year rule. This is the first time that the ACF PD3500 has appeared as a high-quality plastic model and Rapido intends to do this classic and much requested design justice. The body of the Flexi Flo evolved rapidly during its two years of manufacture and the Rapido version replicates all these changes, including different strengthening rib and weld line arrangements. We are also debuting a brand new 125-Ton Barber S-2 truck used under many of the NYC cars.